Ford is going truly global with the 2019 Ford Focus. The automaker has unveiled its future world car. The body has been redesigned to make it appear larger and more comfortable and it will feature the latest in technology. The 2019 Ford Focus highlights Ford’s new global goal, to build fewer different vehicles, each vehicle can be tailored for different markets or regions in the world. The 2019 Ford Focus will be built in China. It will go on sale in China and Europe this year. It will debut in North America in 2019. Alan Mulally, Ford’s former Chairman and CEO, who retired in 2014, often championed this idea. He frequently suggested that Ford should be more like Toyota, offering fewer models, but the types of vehicles that could be sold world-wide. The all-new 2019 Ford Focus will be available in a 4-door sedan, 5-door wagon and 5-door hatchback, depending on the region. The Focus will also have a number of different trim levels and packages, again depending on the market where it will be sold. Ford has stressed recently that it will ramp up truck and SUV production in the U.S. and that the smaller, less profitable cars would be built elsewhere. Ford is not saying at this point what body and trim styles will be available in North America. 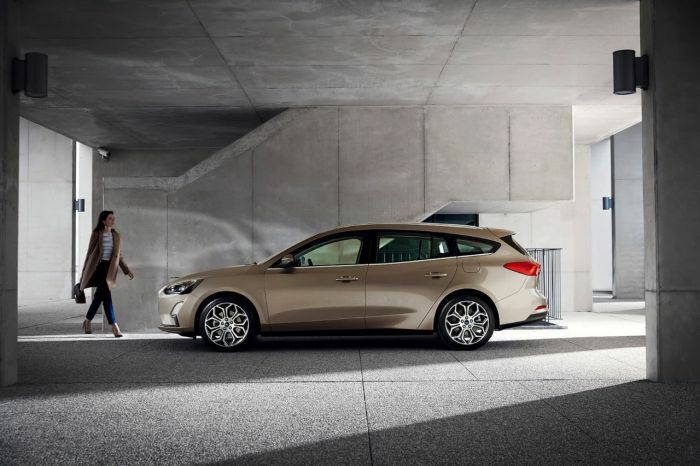 The new Ford Focus appears larger than the current models but the outside dimensions haven’t changed. Ford is saying that they have reconfigured the interior to give passengers more space and allow for more cargo room. As part of its plan to be able to build cars more efficiently, Ford is slashing the number of configurations that it will offer. In its statement, Ford says, “Ford has reduced the number of orderable configurations by as much as 92 percent versus the previous Focus, reducing from up to 360 configurations to as few as 26, depending on the global market.” Fewer changes mean quicker production times and fewer mistakes. Depending on the region, many of the 2019 Ford Focuses will feature Ford’s latest technologies. Usually automakers only provide the technology on the higher end vehicles, but Ford is making sure that the more affordable Focus will have access to the safety features. The Focus will have the Ford Co-Pilot360, a grouping of driver assist technology. Co-Pilot360 includes Adaptive Cruise Control and Park Assist. The Focus will also have Adaptive Front Lighting that adjusts the headlights to road conditions. At this point Ford isn’t saying what powertrain options will be available here. In China, the all-new Focus offers a range of gasoline engines, including a 1.0-liter EcoBoost engine, plus an all-new 1.5-liter EcoBoost engine. In Europe, Focus has two options either a 1.5-liter EcoBoost gasoline or a 2.0-liter EcoBlue diesel. Ford says it will release details about the powertrain and trim levels for the North American 2019 Ford Focus as it gets closer to launch. No word yet on pricing. Of course, the price could be greatly affected by the ongoing trade talks and possible tariffs on items being imported from China.